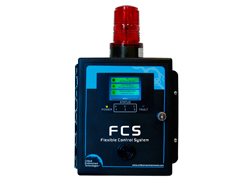 The FCS Flexible Control System is a sophisticated, high performance controller that offers up to 128 gas channel configurations for monitoring toxic, combustible or refrigerant gases with versatile control functionality for non-hazardous, non-explosion rated, commercial and light industrial applications. The FCS is designed to accept inputs from digital, analog and wireless transmitters and/or Peripheral Devices (in various combinations), using Modbus® RS-485, 4-20 mA analog input or wireless communication. 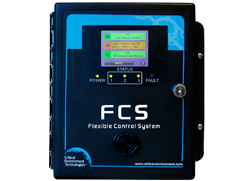 The FCS is available in two models, the FCS-M with Modbus® RS-485 output or the FCS-B with BACnet® MS/TP output for communicating with a Building Automation System (BAS). Standard features include, four configurable SPDT dry contact relays with field configurable time delays and trigger levels, a full colour LCD touch screen with LED panel indicating configurable channel alarm status, relay status and fault conditions, extensive menu system with password protection, enhanced logic control, priorities/zoning capabilities, a USB port for firmware upgrades, data logging and a door-mounted, audible alarm. Optional value added features include, analog inputs and/or analog outputs, a top mounted strobe, a locking door and a water tight, door-mounted audible alarm. The FCS can can be connected to several remote devices such as a remote strobe/horn combo, a Remote Display Module and several LNK Peripheral Devices.